Holly and Ian have been friends of Ilene and Phil of House in the Woods Farm since their now teenagers were in preschool. This friendship allowed Ian to see a crop from seed to harvest, and his friendship with House in the Woods Farm (HITW) allowed him to do this, and sparked their dream of farming. On a yacht trip with family, a business plan was developed, and the dream of farming germinated. Holy and Ian established Jenerations Family Farm in 2018. 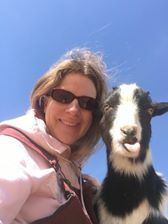 Located in Jefferson, they are a pasture-based mixed livestock farm, and their partnership continues with House in the Woods, an organic produce farm located in Adamstown. House in the Woods Farm has a passion for connecting people to the source of their food, and educating them on how it was grown, and Jenerations Family Farm is on a mission to practice and promote sustainable agriculture. Through the partnership between these two farms, Jenerations Family Farm will be joining the Middletown Farmers Market for the 2019 season, and will be selling a variety of items from both farms. When the season opens, you can expect to find HITW certified organic seedlings for your gardens, including heirloom tomato seedlings. As the season goes on you will also find fresh organic produce that Jenerations Family Farm has helped to grown at House in the Woods Farm, incluing sweet white turnips and beets, succulent cabbages, heirloom tomatoes, cucumbers, peppers, eggplants and more. Jenerations Family Farm also offers barn wood signs and handcrafted one-of-a-kind stone and clay pendants. Members can also participate in the HITW Community Supported Agriculture (CSA) Program right at the market every week! The Middletown Farmers' Market continues to share profiles of our current vendors so that we all have the chance to get to know each other, and what quality products will be offered at the market this season. For additional information about this vendor, or other vendors participating in the market, please visit our Vendors page, email info@middletownmdfarmersmarket.com, or leave feedback on our facebook page. Jenerations Family Farm is a pasture based mixed livestock farm. In partnership with House In the Woods Farm (Adamstown, Maryland), bringing organic produce to the market, with CSA options available.